When I was twenty three, I moved into a post-1906 earthquake building in the Cow Hollow neighborhood in San Francisco. The flat was a funny mixture of old and not-so-old, as old rental buildings tend to be. While the built-in cabinets in the living room had been covered in 1970’s-era faux wood paneling, an unfortunate consequence of a misguided attempt at “modernizing,” no one had ever bothered to improve upon the insulation in the walls. On those cold, foggy winter days when the damp chilly air seemed to permeate the walls, I’d often imagine vintage newspapers shoved into the space between the walls in lieu of insulation. The building was owned by a family trust, one of those old San Francisco families who remembers when they came over from Italy during the gold rush, whether their house had survived the earthquake, and probably had a street named after them. I lived in the unit that my landlord had grown up in, a man who imbued formality into everything he did, even painting the kitchen in impeccably pressed jeans. Once, my roommate and I accidentally overpaid our rent for the month by $4.53, a result of careless math, and we received, on family letterhead, a typed letter explaining our error and a check for the $4.53 we had overpaid. One of the benefits of having such a landlord, though, was his old-fashioned sense of generosity. When the ancient apple tree in the backyard overflowed with tart-sweet, tiny yellow-green apples for two weeks each fall, we’d find large bags of apples waiting on our back porches, ready to be made into apple butter or apple tarts. One Christmas we found a hand-written card and a small bottle of deep, syrupy liqueur, made by the family’s business. It was Nocino, a traditional Italian liqueur made from green walnuts and sweetened into a sticky and indulgent aperitif. Though at the time I was more likely to be consuming cheap rum mixed with coke than an expensive bottle of artisanal liqueur, I learned to mix it into cocktails and have kept a bottle on hand ever since. Here are three of my favorite ways to drink it. 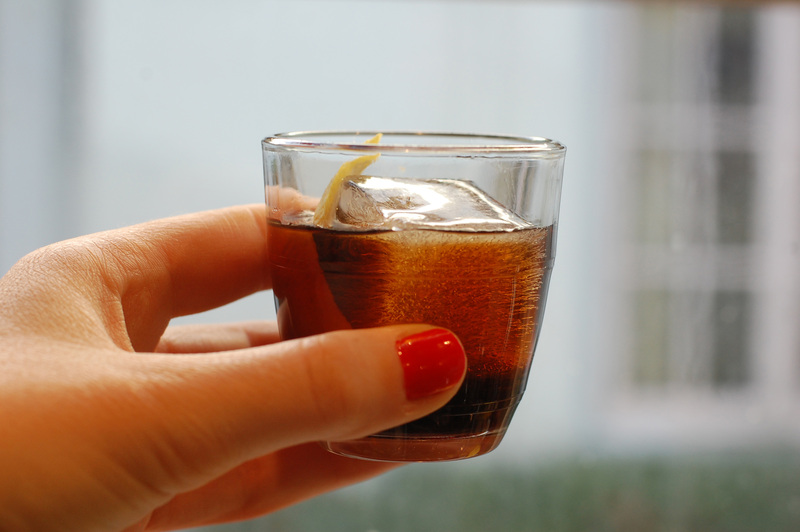 The easiest, and in my opinion the classiest way to drink Nocino, is simply with an ice cube or two and a large twist of lemon. Rub the lemon over the rim of the glass to really ensure that you get a little bit of lemon oil in each sip. Since the liqueur is sweet and heavy, the lemon helps to balance and lift the flavors, making it sippable without being cloying. You will learn this about me – I love milk punch. Chalk it up to the time I spent doing research in New Orleans, but this funny-sounding mixture of milk and booze to me is the ultimate in indulgence. 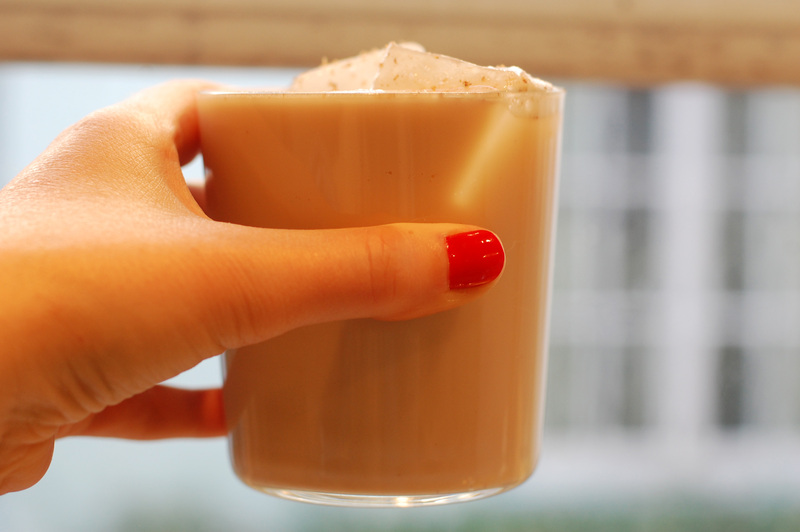 Milk punch is like a frothy, icy, rich milkshake with a bite, and the fatty and rich milk is the ultimate foil for almost any flavor combination you can dream up. This one is warm and nutty flavored, a great alternative to egg nog around the holidays or a cozy but refreshing after-dinner indulgence, even better with a good book. Makes one drink, though you can easily multiply and make a pitcher. To make the simple syrup, combine all ingredients and simmer for about 10 minutes, until the sugar is all dissolved and the mixture has the right amount of spice imbued in it. When it’s done, strain the spices out and refrigerate. To make the cocktail, combine all ingredients in a shaker with plenty of ice, and shake, shake, shake until your arms hurt. No seriously, the more you shake the better it will be – airy, fluffy, foamy and smooth. Or shake for about a minute. Strain into a glass and top with fresh grated nutmeg or cinnamon if you’d like. This cocktail combines two of my favorite food pastimes during the winter, cracking walnuts in the shell and peeling fresh citrus. Often when I have company in the winter I’ll put out a bowl of walnuts in the shell with a nutcracker and a bowl of clementines for guests to peel themselves – it’s a great activity for idle hands when you’re sitting around chatting or playing board games, and if you add in a bowl of dark chocolate chunks, you have the easiest, casual but elegant after-dinner, lingering around the table activity (preferably while sipping on some brandy). I love how it keeps you busy, makes you work for your little treat, and leaves your fingers gorgeously scented with Christmas-y smelling oils. This cocktail captures the essence of this activity, combined with another one of my favorite things, bourbon! 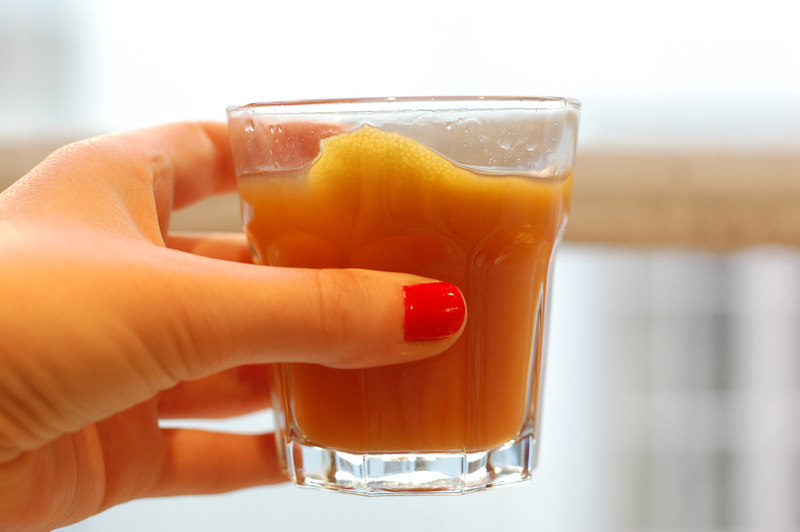 While it may not appear to be the prettiest cocktail on the block (lets be honest – it’s brown and muddy), the taste more than makes up for it’s humble appearance. Shake all ingredients in a cocktail shaker, then strain. Garnish with a big slice of lemon peel, squeezed and run over the rim.